﻿ Paelleras - A la plancha! 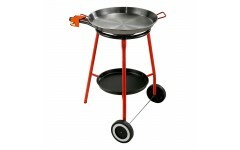 Set which includes one paella (42 cm), one gas burner with 2 rings and one stand with wheel and tray. 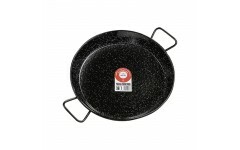 The authentic valencian paella pan made of polished steel (40 cm) with 2 steel rivets. 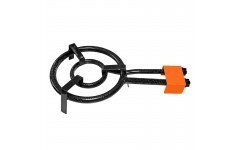 Butane gas burner with two ring specially made for being used outside. 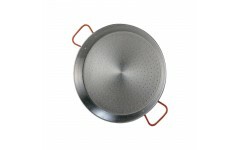 3-Leg set (75 cm height) for your 20, 30, 35 cm gas burner.